As you all probably saw in another thread, I came up with an idea for a future album for Hayley (with accidental inspiration from comet). An album of "inspirational" music, such as hymnns/sacred religious songs, contemporary Christian music, or even some slightly more secular inspirational songs. She has included such songs on several of her albums, as well as some in concert that she's never recorded. The original thought was for a compilation of all these previous songs, plus some new ones. Now, I'm leaning towards a few older songs, like Amazing Grace and Ave Maria, but mostly new ones. There are so many great hymns out there that she'd sound amazing singing! Here are some songs I came up with (and I've thought of a lot!! ), and I'd love to see any of yours, too. Some of the ones by Christian artists are quite old, but they're still great songs. Maybe include some old ones like Amazing Grace, Whispering Hope, and/or The Heart Worships. It would also be wonderful to include I'll Make Music from the Karl Jenkins album, Gloria Te Deum. It's very beautiful. It's hard to say how well her voice would suit the songs originally by men, but then I never would have imagined her singing Majesty, either. I'm glad she did, though! A Christmas song here and there would be fine, too. I'd love to hear her sing Jesu, Joy of Man's Desiring. You Americans. Thanks, Martin. That's more of a patriotic song, though, I guess you wouldn't know that just by the lyrics. However, You Americans would take it as patriotic. I only know a few of the ones in your list, Martin. That's if they're the same songs I'm thinking of. Okay, now, this isn't necessarily a recommendation for Hayley, but I just recalled this fun, Celtic-sounding rendition of The Lord's Prayer. It's called the Prayer Anthem, by Carman. I always loved watching this video on TBN when it was more recent. I do think Hayley would sound great singing it, but the more traditional version would be nice, too. One of the songs I listed in the first post was a song called Strong Tower by the Christian group, the Newsboys, who have been popular in the US for quite some time (the current band has a different lead singer now, yet are still very popular). It's a very enjoyable song. It sort of has a hymn quality, yet it's upbeat, not really the kind you'd play at an organ. There is no music video of the Newsboys' version that I can share here, but I did find this very nice cover of the song. It's a choir from Palikir, Pohnpei (in the Micronesian Islands). I thought they did a great job with it. It's simple but joyful. The guy playing the drum is smiling, which I thought made it even more enjoyable. It's also interesting for me that people from an island I've never heard of know this song. I think it's great, though. I listen to covers of songs originally by men so it's easier to imagine how Hayley might sound singing it. I can imagine her singing it very well, though the verses are a bit low. I always harmonize when I sing along with it, but not sure how that works when you're the main singer. Oh well, she did great with Majesty, so I'm sure she could work this one out, too, if she wanted to. Anyway, here it is. If anyone's interested in the original version, just search in youtube (there is another song with the same title that will come up, so only click it if it says Newsboys). Peter Furler, the former (and better) lead singer from Australia, has a pleasant voice full of conviction, which is a very effective quality in a song about God. He has a way of making the message of a song powerful and meaningful, at least in my experience. He is my favorite Christian singer. There is another former member from the group from New Zealand named Phil Joel who was another favorite of mine. I much prefer their voices over Martin Smith of Delirious, even though I always loved their song Majesty (which Hayley made a hundred times more beautiful, of course). I miss the band the way it was, though Michael Tait is a very good singer, as well. It's just that changing lead singers basically changes the whole face of a band. I suppose all this is more information than most of you care about, but the Newsboys were my favorite artists before I got into classical crossover music. Being from New Zealand, I would be shocked if Hayley had never heard of the group with 2 Australians and a Kiwi. Here's a site I never came across before with a section on Hayley. The most beautiful song of all time! On The Wings of Time (Toki no Tsubasa ni notte) -- Lyrics written by Hayley. Will be a bonus track on Hayley's forthcoming Japanese album 冬の輝き -恋人たちのピュア・ヴォイス" or "Winter Glow - A Pure Voice for Loving Couples". There is a section for adding comments, no need to register, just type away and post. This has always been my favorite part of the Live from New Zealand DVD (the other songs in that medley, too). The song is just so catchy, and I used to love singing along with it. Even though it's been a long time since she's performed the song, finally having the song on CD would sure be nice! I don't know what the Musical Island boys are doing these days, but including them wouldn't be bad, either! I just remembered the song Laudate Dominum from Odyssey. That would count as a more "sacred" song. Something like this would probably help keep the album classical... though are the type of hymns mentioned above considered classical according to the charts, I wonder? Any thoughts? I've thought of a couple other hymns, of course. I'm thinking of too many; she can't sing all of them, but I'll just remember that if she sings any of the ones I suggested, she would sound amazing singing. As you can see, I'm having a little too much fun trying out my newly-discovered trick of embedding tweets onto this forum. But also to show that, despite the fact that I now seem to be talking to myself on this subject, plenty of other members/fans like the idea, as well! (BTW, atrendiwoman is a member of the official forum). Oh no, can anyone else see them?
. 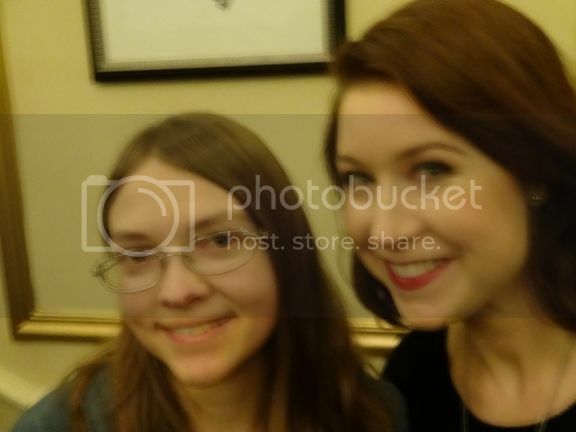 @hayleywestenra neeeeeeds to record a hymns album!!!!! #PleasePleasePlease!!!! I replied saying that I agree, and then she said "She's the best!" Katie said: yessss!!! SO true!!! I can see your embedded tweets just fine! Paige, are you getting an empty box, blank space, etc., in place of them? We will get this workin' for ya! All I see is a blank space. This happens on some other threads as well. This used to happen to me with even just regular photos! But it hasn't happened in a long time. I'm not using a phone, just a regular computer. Sorry about this issue about the embedded tweets, Paige. I will ask the ProBoards folks about this. Can you kindly send me a Private Message and mention what phone model and its web browser version? Also if you utilize the ProBoards app on occasion. We'll get this sorted. Libby, thanks very much for sharing what Hayley tweets, retweets etc. Much appreciated!! I've thought of another song, a classical one. After I started listening to Sarah Brightman and buying her music, one of the songs that quickly became a favorite was Solo Con Te from La Luna. Her voice and the music are so beautiful and exquisite, that listening to it feels like being sent to heaven. I thought it sounded like it was from some classical piece, and it turns out it's from Handel's Dank Sei Dirr Herr (Thanks be to Thee). I think this would be a great classical piece for Hayley to do, whether she does the hymns album or not. But especially if she does, this would be a wonderful song to include.